The Mirage Alex Resort should be at the top of your list for accommodation when planning your next Sunshine Coast holiday. 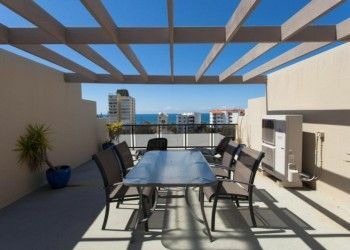 This is the perfect Alexandra Headland accommodation located on the “Sunshine Strip” between Mooloolaba and Maroochydore. You’ll find plenty to do on the Sunshine Coast, or equally an idyllic resort to do very little. De-stress, unwind and enjoy the laid-back atmosphere of the “Alex” township. It’s a friendly little community that’s become a popular destination for surfers with the Bluff at Alex Headland providing consistently great surfing conditions all year around. The luxurious four and a half star apartments of the Mirage Alex Resort have balconies that are east-facing, with views of our beautiful pool and gardens, the lagoon, park and ocean. Whether you choose a one, two or three bedroom option, each apartment is fully appointed with queen bedroom and ensuite, separate toilet, laundry with washer and dryer. The kitchen is also fully equipped with granite tops, with spacious dining, lounge and balcony areas. Other creature comforts include: air conditioning, ceiling fans, Foxtel, DVD player, stereo, and the all important free wifi. 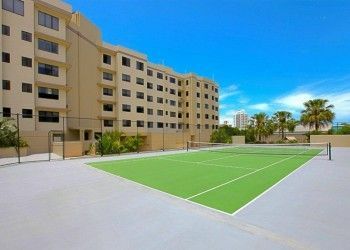 You can be assured that you get all these amenities, even with the one bedroom option, because the one bedroom apartments are actually two or three bedroom apartments with the extra bedrooms locked-off. The luxury of larger apartment space, all for one bedroom prices. Would you enjoy more private accommodation? By upgrading to the rooftop option you get your private outdoor lounge area with a BBQ. Whether you are looking for family accommodation, or a one bedroom apartment for a romantic weekend getaway The Mirage Alex Resort has an option that will suit you. 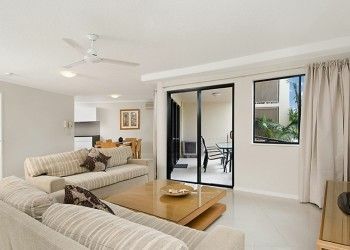 Book or enquire now for your Alexandra Headland accommodation on the Sunshine Coast.